From the sketchbooks of da Vinci to the notebooks of Halprin, artists and designers have been creating and communicating their ideas through drawings. Although technology has enhanced our ability to share these ideas, little has changed in the way that designers develop their ideas since the days of Bauhaus. This entire process has always been very personal and hands-on. It relies on the direct interaction of designers with the representations of design ideas from concept to detail that traditional media have always allowed. Despite advances in hardware and software, bridging the gap between CAD and freehand drawings is still a challenge. The use of Interactive Pen Displays is one way to address this challenge. 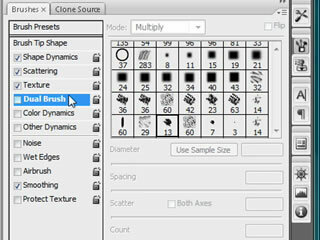 These tools allow the use of traditional “hand” graphic techniques while leveraging the many advantages of digital technology for visualization and representation. 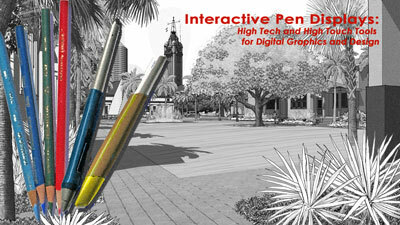 Pen Displays can be used for generating and evaluating design ideas, sketching, rendering, and design critiques and presentations. 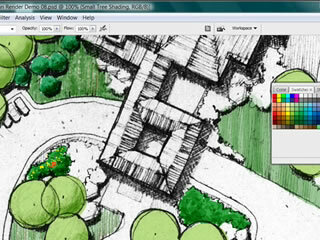 They allow you to leverage all of your traditional drawing skils and help keep high tech, high touch. In addition to Photoshop tips and techniques, I plan on adding techniques and tutorials for SketchUp, Illustrator aud Vue. 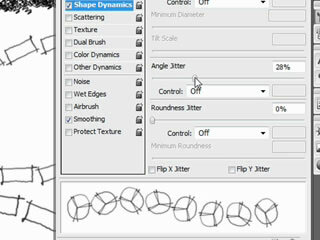 I have also included information and links on the Wacom Cintiq Interactive Pen Displays that I use with Photoshop. Use the links on the left for more information.